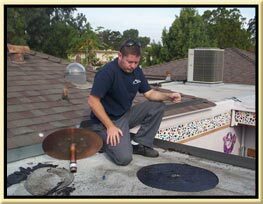 Gutter cleaning should only be done by a licensed and insured roofing or gutter installation contractor. As a licensed C-39 roofing contractor insured with workers compensation and 2 million dollar general liability insurance we can help with the installation of a new gutter system or the cleaning of you existing gutters. We do not charge for gutter cleaning estimates and if you have a tile roof you have the peace of mind of knowing that we know how to carefully walk on them and not break roofing tiles. If we break any roofing tiles while cleaning your gutters we will replace them at no charge! Your gutters can be damaged in many different ways: ice buildup, tree branches, clogs, improper installations, debris, and more. If you've discovered that your gutters don't drain like they should, give our experts a call and we can check them for you. While checking you gutters we will check to make sure you do not have loose sections of gutters and we can inform you for gutter that are not correctly leveled. If your gutters are clogged with leaves, ice, or debris, it could lead to water backup and eventual damage to your home. Let us perform a gutter cleaning and get your gutters back in order. Call us today and before the rainy season to get your gutters cleaned!